You can help maintain My ChurchSuite engagement among your church members by keeping the content fresh and up to date. One of the best ways to do that is to provide customised menu options, called External Links. External Links could be to your church web site, your church's social media pages, a church DropBox folder with leader or small group resources of kid's curriculum. In fact, what you decide to link to is limited only by your imagination! The functionality becomes really exciting when you see that external links can be made visible based on a person's tags, meaning you can easily deliver custom content to each member of your church based on their tags. Providing external links mean your church members can access everything they want, all from within My ChurchSuite - and that's why they'll keep coming back. Go to the "Address Book" module settings (cog-wheels in the top right corner of the module). You'll need Manage module or Administrator permissions to do this. Click on the My ChurchSuite settings section. Scroll down to the section called "External Link". Here you can add a custom menu item in My ChurchSuite, provide a Name for your menu, and then the URL. Importantly, you can make you external links member-specific; perhaps making certain links only visible to those who belong to a particular Tag or Tags. 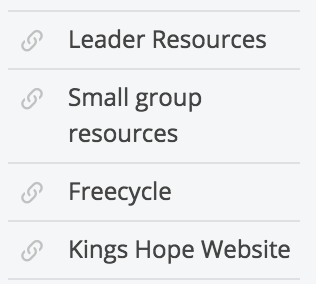 So for example, put all your small group leaders in a Tag and only make your small group resources available to that Tag group. Or how about links designed for newcomers that are based on whether people are in your newcomer tag? Remember to save any changes you make before navigating away from the module's settings.